Safe Browse App might make you believe that it is actually a security application that helps you browse safely; well, maybe in an alternate reality. As a matter of fact, we have found that this is a totally useless program that, in reality, functions as an ad-supported application. As such, it is possible that this adware may present you with possibly unreliable third-party content that may lead to more infections on-board or worse. It is already possible that you have several more malware programs on your computer since this adware usually does not come “empty-handed.” Due to the potential threats this program can introduce you to, we have no choice but to advise you to remove Safe Browse App ASAP. This is not a unique adware program in any sense; in fact, we have found it identical to PriceChomper and Price Slayer. 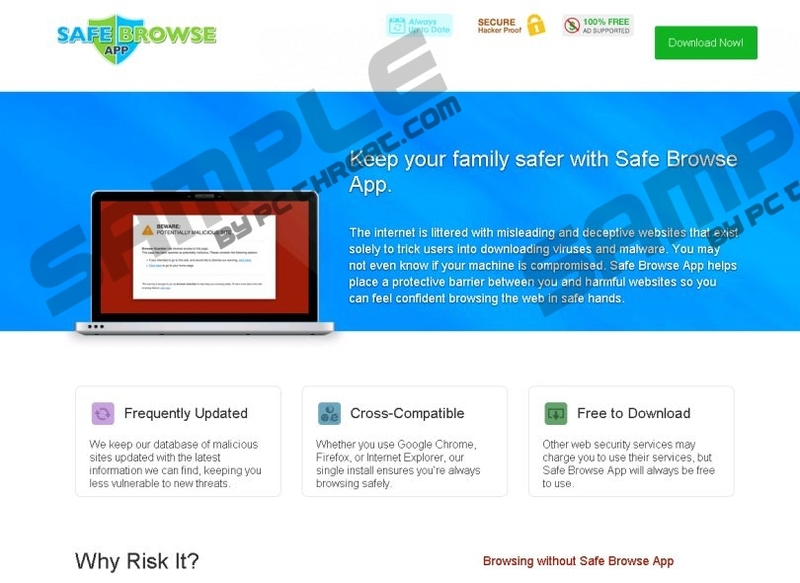 Just like all the other applications created by Intriguing Apps, Safe Browse App also has an official-looking website at safebrowseapp.com, which resembles all its predecessors' websites. Even if the design or the colors may be different, the functionality is definitely identical; or should we say, “the lack of functionality." If you want to download this application, which can allegedly help you “keep your family safer,” you will be disappointed to be faced only with a pop-up message that says you cannot currently download the browser extension. Those irritating maintenance issues, right? How convenient -- and, at the same time, how suspicious. Since all the apps have been showing the same behavior on their respective websites for a long time, there must be some serious issues going on. There is no doubt that you are better off deleting Safe Browse App before things get worse. Of course, there has to be another way for this worthless adware to spread on the web if it is not available on its website. That is why it can be found in freeware bundles packed with other malware infections. If you have this version on-board, it is quite likely that you have multiple security issues. Even if you delete Safe Browse App, your computer will still not be free of infections. If you do not address this issue, things may turn from bad to worse. Safe Browse App is supposed to be a security extension that keeps you away from malicious websites. But, in this reality, unfortunately, it can actually expose you to malicious websites. How? Through the uncontrolled and unreviewed third-party ads it keeps displaying on your screen. What do you think may happen if one of these third parties is a group of cyber criminals? We think you would agree that visiting a compromised website would not end well for your computer or possibly even your bank account. Removing Safe Browse App is the only choice for you to keep away from these potential scenarios. So let us provide you with the solution against this annoying adware. If you use our guide below, you can easily make Safe Browse App disappear from your computer. All you need to do is to find the application in the list of installed programs in Control Panel and run the uninstaller. Does that sound simple enough? However, please remember that there may be other threats still hiding on your PC. These also require your immediate attention. We suggest that you use a trustworthy antimalware application so that you can automatically tackle all the issues your system is facing. Right-click on the unwanted program and choose Uninstall. Quick & tested solution for Safe Browse App removal.